[ John Spencer Smith, diplomat, politician and writer. ] Autograph Letter Signed ('J. S. Smith. | president de la Société Linnéenne, vice prés. de celle des Antiqq. de Normandie, &c.'), in French, presenting two of his works to 'Mr. N[érée]. Boubée'. 'Caen rue des Chanoines 3'. 2 August 1835. 1p., 12mo. In good condition, lightly aged and worn. Addressed on reverse (with 'R.S.V.P.') to 'Monsieur N. Boubée | correspondant de la société linnéenne de Mormandie | Paris'. (Nérée Boubée, naturalist, Professor at the University of Paris.) He offers him two works: he is the 'compilateur' of the first, which is titled 'Souvenirs de Bayeux', and 'editeur-annotateur of the second, 'la biographie de Bochart', of which 'le texte est l'oeuvre d'un de mes fils'). It may be that in his reading of the two Boubée encounters 'quelques passages susceptibles d'être cités dans l'Écho du monde savant'. [ Société des Auteurs, Compositeurs et Éditeurs de Musique. ] 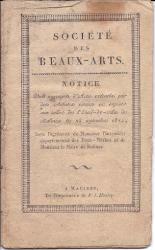 Two printed forms listing in small print the 'Etablissements' of Paris and elsewhere (including concerts, circuses, balls, casinos, theatres), and giving the royalties of 'Madame Dutry'. Société des Auteurs, Compositeurs & Éditeurs de Musique [ Paris, France ]. The two documents are: the '248me Répartition (Avril 1911)' and the '249me Répartition (Juillet 1911)'. The two forms are identical in layout, but the first has the printed date April 1911 and the second July of the same year. Each is 4pp., folio, on a bifolium. The form is divided into: 'Paris', 'Banlieue', 'Départements' and 'Etranger', and lists venues ('Etablissements') - those in Paris in larger print and the rest in smaller print - under the headings 'Concerts', 'Bals', 'Théâtres', 'Cirques', 'Casinos', 'Concours et Festivals', 'Forains'. The famous Paris venues of the period are there, including the Folies Bergère and the Moulin Rouge. [Société marocaine de Production cinématographique.] Four items: typed synopsis and press release for Vicky Ivernel's film 'Kenzi' ('Mon Tresor'), with two ALsS from producer J. M. Brandel in Paris to English distributor Wynne-Rushton. Both of Brandel's letters on his letterhead, 23 Rue Raynouard, Paris. One dated 19 October 1947 and the other (earlier) undated. Typed synopsis and press release both undated, but on release of film in 1948. The collection is in fair condition, on aged and worn paper. The six items are from the Wynne-Rushton papers. The first four relate to the 1948 Moroccan film 'Kenzi', for which Wynne-Rushton was working as English distributor, produced by the Société marocaine de Production cinématographique, produced by Brandel's company Eden Film Productions, with French actress Simone Berriau (1896-1984) as art director, and featuring a young Habib Reda (1932-1974). ONE: ALS from Brandel ('Joe') to 'Dear Gerald'. 2pp., 8vo. Slight staining to second page. [1814.] A Malines, De l'imprimerie de P. J. Hanicq. 12mo, 22 pp (followed by final blank leaf). Stitched pamphlet. Text clear and complete. On discoloured and worn paper. 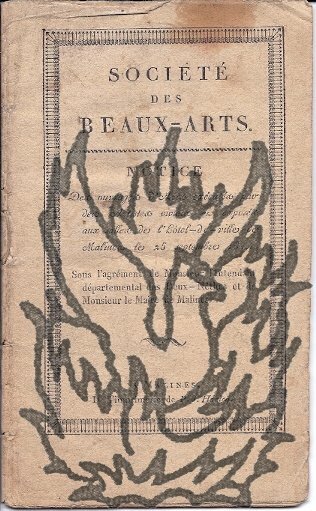 152 'ouvrages d'arts' arranged in alphabetical order under the names of the artists, from 'François Alewaters, peintre à Malines' and 'Henri Adams, à Malines' to 'G. P. Wuyts, de Lierre' and 'L. Zwitzer, de Malines'. Preliminary notice headed 'Police du Salon'. Scarce: no copy on WorldCat or COPAC. Autograph Letter Signed ('Marsy'), in French, to 'Monsieur le Président et Cher Confrère' [Monsieur Théodore Hippert]. 15 January 1894; on letterhead of the Société. 12mo: 4 pp. Good, on lightly aged and creased paper. 65 lines of text. Discusses, among other matter, the recipient's 'Exposition de Dentelles', a 'voyage à Bruxelles', a 'très agréable reunion à Abbeville', and a trip by 67 members to Kent. Accompanied by a ten-line manuscript biography of de Marsy, in French in a contemporary hand, tipped in onto another slip of paper cut away from the letter's envelope, and bearing the address in de Marsy's hand. Autograph Letter Signed ('E. Cortambert'), in French, to 'Monsieur le Directeur de l’Athenæum français, Rue Mazarine, 9 | Paris'. 21 August 1853; Paris postmark. 12mo, 2 pp. Bifolium, addressed, with circular postmark in black ink, on otherwise-blank second leaf of bifolium. Correcting 'une petite erreur' which he committed in 'le Comte rendu de la dernière Séance de la Société de Géographie', and which he wishes changed in the report which will be appearing in 'l’Athenæum français'. Two Manuscript Letters (both signed 'Lefebvre-Ducrocq') to Martin, one to Martin and the other to Flobert. The letter to Flobert carrying an Autograph Note Signed by the recipient ('Paul Flobert') to Martin. Letter to Flobert, 19 November 1917; letter to Martin, 30 November 1917. Both letters on letterhead of the Imprimerie Lefebvre-Ducrocq. Both items 4to, 1 p. Both on creased paper with closed tears neatly repaired on reverse with archival tape. Letter to Flobert: Most of the type of Martin's article (in the 'Bulletin de la Société Archéologique, Historique & Artistique le Vieux Papier') still exists, and the printer asks to be informed what quantity of the offprint he requires. 'Le cliché de la 1r page, qui sert à frontispiece, a été renvoyé à M.
Autograph Letter Signed ('Legentil') to 'Monsieur Tessier, Secretaire de la Société des Inventeurs 16 Rue N/Dame des Victoires'. 4to, 1 p, 18 lines. Addressed on verso of second leaf of bifolium. Good, on lightly aged and creased paper with a few closed tears along folds. Written in French. He regrets that he cannot respond to the appeal that Tessier has made on behalf of the Société des Inventeurs. When he retired from business he thought he would have 'des moments de loisir', but the experience of each day teaches him the contrary, and his time has never been so occupied. 26 April 1884; Paris, on letterhead of the Ministry of Agriculture. 8vo, 1 p. On aged paper, with wear and closed tears to extremities. Good, clear signature. Thanking Bailly for the 'cartes' and the 'lettres d'invitation' to the 'Salon de 1884'. Inauguration du Nouvel Hotel de la Societe; le 14 Janvier 1897. Paris: Aulanier et Cie, Editeurs; 13, Rue Bonaparte, 13. [Imprimerie de la Construction Moderne.] 1897. Octavo: 27 pages. A rather nice production, with nine double-page plates, frontispiece and double-page table. Unbound. In original grey printed wraps, with gold foil seal of the society laid down as part of cover design. Good, in lightly aged wraps. Some tissue guards. Two essays: 'La Societe des Ingenieurs Civils de France de 1848 a 1896' by M. A. Mallet, and 'Le Nouvel Hotel de la Societe des Ingenieurs Civils de France' by M. F. Delmas ('Architecte de la Societe').